Found some hessian potato sacks at South Heath GC; typical. They usually sell everything... only once caught them out and that was for something totally silly. Got my garlic for next year. Lots of Marco this time - bought six! 10 or so big cloves per bulb and a few smaller ones, but it´s been proved you get better bulbs from larger ones so I shall just use those. Should get 60-65 in sometime this week, which after the nightmare work project from hell that has eaten lots of my time for the past month is almost entirely time off in lieu. Bulb planting will be the biggest project, followed by getting the ancient blackcurrants pruned to the ground so I can clear more of Plot 2 at the top. Most importantly, relaxing. Cloudy first thing. Big humph. Wanted to see eclipse. :-( Oh well - should be able to get lots of other stuff done at the lottie. Much nicer day. Warmer too, so packed the car and went up, deciding I´d got so much stuff that I´d drive right up. Started off by hunting marrows: three huge ones went straight into the car. Got all the stuff out and then dug out three clumps of loganberries. They´ve never done anything and I´ve never picked more than a couple of (sour) berries so that´s half of them gone. Then dug out an 8" depth and started planting narcissi. By the time I reached the other end, I´d planted about 160 bulbs of four varieties - Red Devon AGM (yellow with red eye, mid-season), Tête-à-tête AGM (early), Jetfire AGM and Verger (white with red cup, late season). Probably all planted too deeply but I need to be able to overplant without disturbance. Plus it´s a raised bed anyway so easy to rake away some soil if it´s too deep. Decided to attack the blackcurrants with the secateurs, and cut down a fair chunk of the first bush. There´s lots of it... Moved on to the spuds and after flattening and raking the earlies bed ready for the next crop, got a bucket ready and started carefully digging out the Rattes. Got quite a lot! Accidentally got a Sárpo too - the tubers are pretty huge! Moved onto the three remaining Pink Fir apple and got a lot of those too. 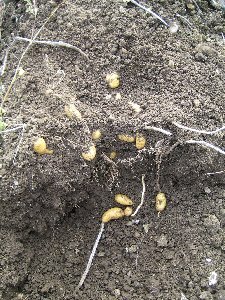 The soil is fantastic - potatoes are really very good for breaking it up! Back to the blackcurrants, and a lot of secateur work before loading the first half into the car and hoofing to the dump. Back for part two, then home to deliver potatoes and marrows before going back for the sunset shift, raspberries, incinerating a lot of teasels which are seeding *everywhere* and digging out half of the sweetcorn. Didn´t get to the tomatoes of which there are still loads. Back home, realised I´d strained my wrist with the secateurs, and ended up having to strap it. Typing this hurts somewhat. Going to stop now. Wrist feeling normal after a night´s rest and some anti-inflammatories, though I don´t think I shall be doing any bush chopping today! So much for the week off doing the lottie. Only just able to go back up there today. Never mind! Started off by finishing digging out the sweetcorn plants. I had done the easy ones on Tuesday. Today I got to the minipops, which have roots that go down miles and which take some bashing to get the soil off. Finally got them all onto the compost heap and then emptied two bags of leaf mould onto the bed. That should help rejuvenate the soil a bit. Planted the bag of `Electric´ red overwintering onions. They just fit! The leeks look bigger now they aren´t being shaded by a huge corn stand! This time took the long loppers and got the rest of the pesky blackcurrant bushes down with that. There´s just stumps now. I still can´t believe how much space there now is. Picked the remaining green sungella tomatoes and the few unblighted cream sausages left on. The Gartenperles are still going red happily. Picked a boxful of ripe ones. Weeding time. Last year´s onion bed was pretty much overgrown and so it was time for a tidy up. but I think they´ll have to come out too. The salsify is also in that bed, but will have to stay there for the duration. It forked terribly so I may just dig it all out at some point. The urgency is because it´s the scheduled garlic bed for 2006: I need to add bonemeal or blood, fish and bone, and some leaf mould to bump up fertility as it´s the really dusty bed, and then I can plant the cloves. There´s a lot of bindweed in it, too. That I shall have to clobber next season - have dug out as much as I could for now. 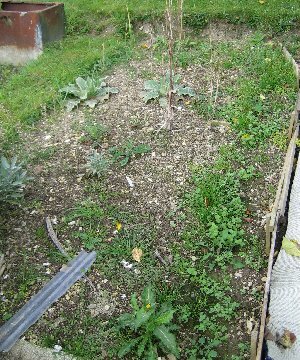 Ate a few apples, added BF&B to the spring cabbages and narcissus beds, and decided that I have to do something drastic about the French beans bed, since they´re still going... and I need it for the last lot of overwintering onions! A murky start turning into a lovely day by lunchtime. Rather typical that I had to go at that point! But did quite a lot beforehand. 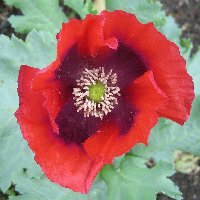 Took two more just-flowering poppies out of the garlic bed (pity) but just had to leave the third as it is a fabulous colour and I would very much like it to self-seed if there´s time for it to do so! Cleared the climbing French beans and a row of forky salsify to make more room, added a couple of binliners of leafmould, forked it in and then planted some 60-odd Marco garlic cloves. They should do nicely for next season. Planted a packet of Chionodoxa luciliae and one of Crocus tommasinianus in the bulb bed; not that far down as they are much smaller bulbs, but enough that they should create a lovely display among the Tête-à-tête narcissi. The chionodoxa particularly should work well, as they´ll not flower till late March/April, by which time the Têtes will have gone over and so they´ll fill the gap with blue and white while the main daffs flower. I´ll put Red Riding Hood tulips in over the rest of the narcissi, so I get some more colour later on. Didn´t get round to the tomato clearing, mostly because I was diverted by clearing the fruit bush area. 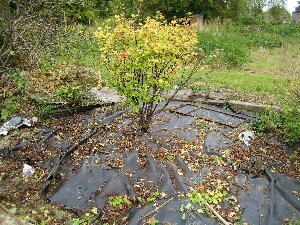 Cleared the black plastic sheeting of leaves and debris with a tiny witches´ broom I got in Tesco for 74p (!) and put down the thicker but battered blue tinged sheeting I´d used for the cloche earlier in the year. We will be getting a load of manure put on top of it, which will hopefully not get bindweed invasions from below. No idea when I´ll get back up there - free weekends from here on in are going to be in short supply and the clocks go back in 2 weeks. 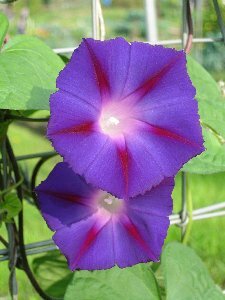 But at least I got some snaps of the self-seeded ipomoea by the gate before frost gets it. After a very wet weekend spent in Edinburgh, it was dry enough to pop up and see what was growing. More than I expected! The onions are growing well, as are most of the garlic. Unfortunately there´s a crater in the middle of the garlics: the darling little foxes have been at it again. Good job I´ve a few spare cloves... Most of the spring cabbages have shot up in size: mostly the Excel (pointy). The round ones (Spring Hero) which I really wanted to grow got nibbled and so are looking rather beaten up as a result. Caulis look ok, and the two mystery brassicas are also looking ok. The broccoli bed is nearly completely eaten now. Sob. Weeds are popping up again now the rain´s arrived, and the beans are ready for clearing. However, the courgettes gave me four more fruits! No manure yet. The Sárpo Mira potatoes are now ready for digging, and to my surprise, a volunteer in the earlies bed has sprouted and I think I´ll put a bottle cloche over it and see if I can get fresh new potatoes for Christmas! Forecast was dreadful but thankfully I´d totally forgotten about the clocks going back, so I got out there quite early in half-decent conditions. Turned out to be perfect levels of moisture in the soil. Had the intention of digging the maincrop potatoes out now that they have died back, and it was definitely an experience. Some of them were massive! 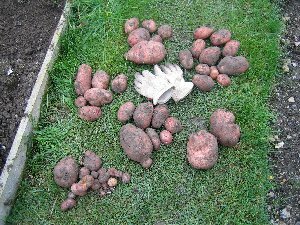 The seven plants I´d got left (one I got the other week) filled a bucket with their potatoes, so far weight unknown but one of the larger ones was a pound and a half alone, and got turned into soup! The dug-out soil then raked perfectly back, and then Chris and I carried the sodden carpet off the old manure heap back to cover it. We now have a new manure heap. And a monster it is too. It´s certainly a day for large things - the manure heap looks smaller than it is because there´s a foot drop beyond the grass road edge! But the redcurrant is now buried - should do well next year. Decided to go and pull a couple of carrots, and discovered they too had got the monsters. Got a couple of whoppers! Nice, properly shaped ones too. Took stuff to the car in a shower, thinking that was it, and then it brightened up so back I went. 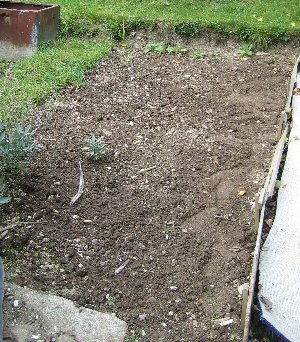 Finally got shot of the tomato haulms and dug the surface over (not too well, as it´s brassicas next year) and then added a decent layer of manure. That should sort that bed out (even if the last of the gartenperles are still going and I haven´t yet got the minicorn out!). No new foxholes in the garlic; planted a couple of new cloves off some of last season´s bulbs to fill the gaps. Hopefully they´ll catch up. 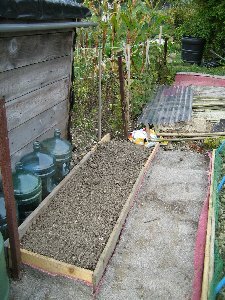 A couple of the red onions hadn´t sprouted so filled in those gaps with some I´d not planted, and put two `reserves´ in at the bed side. So they´re all on their way. Next: weed the shallot/experimental onion bed. Kind of tricky as the tiddly onions I grew from seed have just grown sets, and are sprouting like crazy. It´s supposed to be tomatoes or spuds next year, so I guess it´s tomatoes so the onions have a second chance to grow. They´re not overwintering ones, but they´ve the usual two chances! 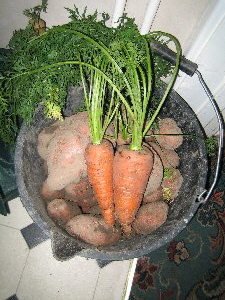 Whopper carrots as well as spuds: the bucketful that made it home. Well now the clocks have gone back, so I won´t be making it up there in the weekday evenings, but this is the time of year when a little bit of prep reaps huge rewards later on, as everything´s ready for the next growing season. 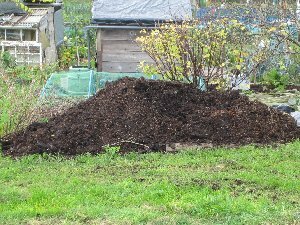 This next year is the first year I´m going to do the proper no-dig system, so manure is just going to be spread over the tops of the beds then carpeted. Potato areas will be manured as they are planted, so gets me off the hook till March!